During my last trip to Detroit in early December there was one major sports priority, and that was seeing Little Caesars Arena (LCA) in "The District." On December 5, 2017, George Eichorn, Myself and Candice Ebling worked the Red Wings vs the Winnipeg Jets. We arrived at the venue around 4 pm and Red Wings Public Relations Assistant Kyle Kujawa was really super about giving Myself, Eichorn and Ebling a tour of this Magnificent Crown Jewel. on a different floor and when I saw this, the only question which came to mind is how can anybody not come across impressed? Not only do the Red Wings use this for practice but it's used for youth hockey. To try to dig this deep underground for a venue in Florida, one would go on a date with a shark. Kujawa gave us the personalized tour of everything in the arena. If he ever leaves the Red Wings for a job in the hospitality field as a tour guide, he would easily get my recommendation. All of us were able to walk around before the game and took some neat pictures. Even Eichorn, who had covered a couple of games before our visit got to see some new things. Eichorn and I sparred and even though Don King Productions wasn't paying us money for a main event, it was neat taking this type of photo. I was truly amazed at all the restaurants at the arena as well as the souvenir stores. But what floored me the most were the man holes of all the names which have been a part of Detroit Sports History. 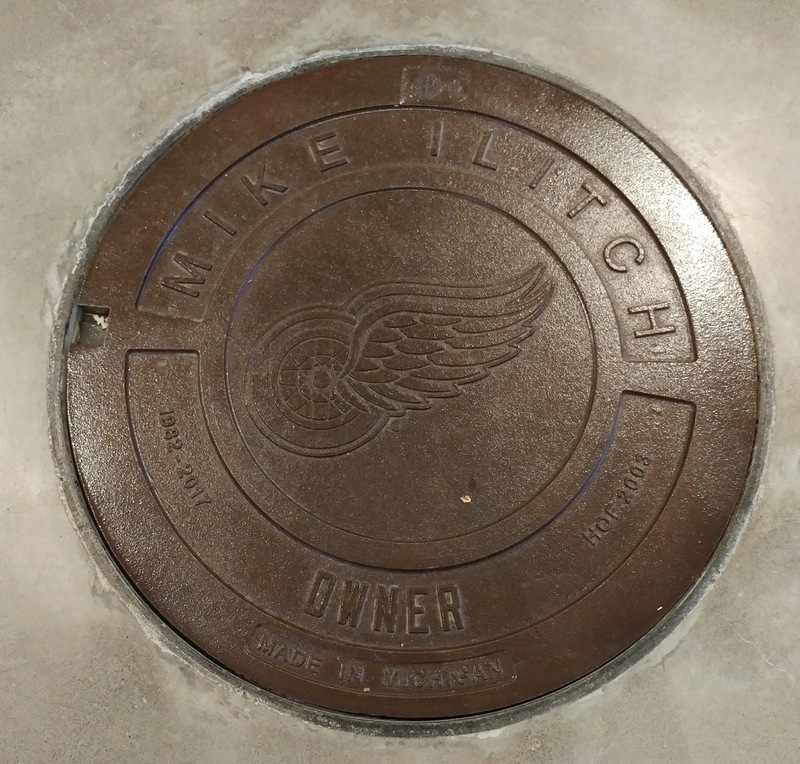 As you can see in the photo on the left, the man hole of late Red Wing Owner Mike Ilitch, is the reason why this arena is standing as he's been the true catalyst as to why Detroit has made an incredible comeback. He's the main reason the Red Wings won four Stanley Cups and reached the playoffs 25-consecutive seasons. To embrace Gordie Howe, Joe Louis, the great Pistons teams, LCA was like walking into an actual Sports Hall Of Fame. When we were there, there was work being done on the office space. The area around the stadium is still being developed. Being around the Red Wings my entire life, first as a fan than as a member of the media, it was great to see Olympia Stadium's letters on display in this "New Gem." While I enjoyed Joe Louis Arena, to me, Olympia will always rank amongst the best stadiums I've ever witnessed a sporting event in. When you go into a new arena, you expect the media lounge, locker rooms, and press box to be first class, therefore, I will not spend much time talking about this. For the media people complaining about how high the press box is above the ice, those comments will be heard on deaf ears. As long as I have sufficient space to connect my computer, spread out, and go over my notes, I'm happy with that. I have to admit that it was neat hearing an Organist at LCA. times having an attractive female interacting with the fans as visualized on the big scoreboard. I've seen that for years at the BB&T Center in Sunrise, FL., covering the Panthers. What was different about this Red Wings home game was not hearing a tape recording of late PA Announcer Budd Lynch talking at the end of the period. But I understood that it was in with the new and out with the old indicating a new building and era of Red Wings Hockey. At least the Red Wings had Karen Newman singing the National Anthem. Over the years, I've traveled to some of the newer arenas around the USA. Some of the impressive ones include: Staples Center (Los Angeles, CA), America West Arena (Phoenix, AZ), United Center (Chicago, ILL), Bradley Center (Milwaukee, WI) which will be replaced next season, Target Center (Minneapolis, MN), Nationwide Arena (Columbus, Ohio), AT&T Center (San Antonio, TX) Amalie Arena (Tampa, FL), American Airlines Arena (Miami, FL) and as aforementioned the BB&T Center in Sunrise, FL. Some of these venues had practice facilities right next to or connected to the stadium. I was impressed with what I saw in Phoenix and Columbus. Each are different and special in their own way whether they're part of a downtown revitalization or near water. But the one thing that stands out about Little Caesars Arena is it's located within a half a mile from Ford Field and Comerica Park. It's unheard of to have all four major sports teams play in that close of a proximity. If Major League Soccer passes on Detroit as a future expansion area, playing at Ford Field, not only will it miss on three billionaire owners and an excellent fan base, they'll lose a large TV Market and a chance to be part of a downtown area making a huge comeback. You won't find a more sound ownership group than Tom Gores, The Ford Family and Dan Gilbert. But let's face it, for $862.9 million dollars to construct, you're going to build an arena for the ages. To use the word potential for not only the arena's finished product and surrounding areas describes what Detroit has to bring me back wanting more when I return home. Seeing this place figures to be an annual opportunity to cover the Red Wings. I guarantee that by the time LCA gets outdated many decades later, I will be long deceased and never see its replacement. There are some cities which will tear down buildings inside of 30-years old. It will be unfortunate to see the Palace of Auburn Hills give way to the wrecking ball. I'm still puzzled as to why a State Of The Art Building such as this one can't be utilized for some purposes especially since it's paid off. There are other metropolitan areas which have multiple arenas in use. Los Angeles has Staples Center, and The Lakers former home The Forum, New York has Madison Square Garden and The Barclays Center. In Minnesota, the Wild play in St. Paul while the Timberwolves play in downtown Minneapolis. My home area is the best example. In Downtown Miami, The NBA's Heat play at The American Airlines Arena meanwhile in the suburbs, the Florida Panthers of the NHL, play in the BB&T Center in Sunrise, and therefore, there are enough events to hold in each building. I love the BB&T Center! This place is more centrally located to Dade, Broward and Palm Beach Counties and the Miami Marlins should have built their new stadium in Sunrise, FL. For youngsters to be able to practice, play hockey games, tournaments on a rink for which its own NHL team uses creates its own "Ice Of Dreams." As of this post, the prospects don't look good for either the Red Wings or Pistons making the playoffs. From what I've been told, there have been a fair amount of empty seats at their games. Whether that's attributed to each teams' struggles or the newness of the arena where fans want to check out the numerous things to do, restaurants, etc... is subject to ones opinion. I have a feeling that the louder crowds will come in time when the honeymoon phase of the arena wears off and these teams are winning. By the way, the Detroit Red Wings defeated the Winnipeg Jets 5-1 in my only and initial trip to the arena. Yes, there was a game played and what was even more special was seeing many old friends again that I haven't seen in a long time since I don't get home as often as I like. Health permitting, I expect that to change. I look forward to covering the Red Wings in the Stanley Cup Playoffs in the not so distant future. I do spend money on the NHL Center Ice Package and these guys have been involved in a lot of one goal games, but are fun to watch. It will be interesting to see how this team grows together with a nucleus of Dylan Larkin, Anthony Mantha, Tyler Bertuzzi, and then the eventual retired jersey of Henrik Zetterberg when it gets eventually raised into the rafters.